•Your dog must be 100% friendly with all dogs. 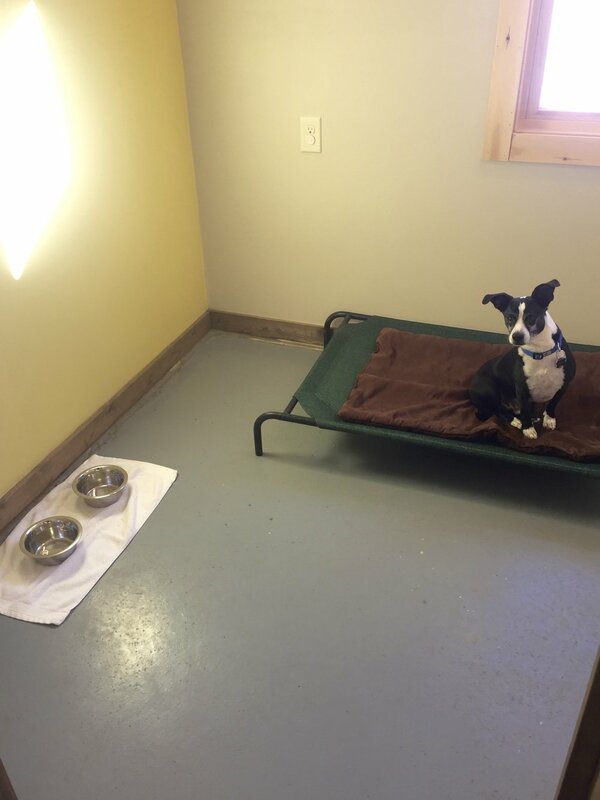 •Each overnight dog gets integrated into daycare to spend time out of their room socializing, playing, exercising, and hanging outside! •All of our rooms are the same design and size. Our prices differ in the amount of daycare your dog requires. We encourage you to not book the minimum for your dog. Remember, a tired dog is a happy dog! •Overnight reservations are on a 24 hour schedule. If you pick up your dog beyond 24 hours you will incur a daycare fee. ALL DOGS UNDER THE AGE OF 8 MONTHS ARE REQUIRED TO BOOK DELUXE OVERNIGHT. We have limited space for overnight dogs. Please book in advance. Families with multiple dogs pay for each dog each night even if they share a room. Each dog gets personal attention, lots of love, and playtime! Our packages are sold at a discounted rate. You have 90 days to use before they expire. >>> At home check-in includes changing water, feeding and treating, a stroll around the block, giving medications, cleaning the litter box, watering indoor/outdoor plants, taking out trash and recycling, texting a picture of your animal having fun. Please cancel reservations as soon as possible. Cancellations and No-Shows that take place less than 48 hours of the scheduled date will be charged the full amount of their scheduled stay. Holiday bookings require a 50% deposit due at time of booking and are non-refundable. Peak dates will incur a surcharge of $5 per day.